Psychological Manipulation: What it is and How to deal with it. Those who are disturbed by the level of incivility demonstrated in the recent presidential campaign have reason for concern. One of the important lessons emerging from new research is the finding that many people are simply unable to have reasonable conversations with those with whom they disagree. Specifically, irrational conversational patterns which employ psychological manipulation occur more frequently than was previously believed. Unfortunately, emotional manipulation is not limited to politicians. Whether in the workplace, with friends or at home, the use of psychological tactics to gain the upper hand and control disputed outcomes is widespread and is not only frustrating but can be even abusive. While most of us have encountered someone who is “manipulative”, it is sometimes difficult to understand why things don’t feel right or know just what exactly is going on. Here are some tips to help you recognize, understand and deal with these frustrating situations. To begin, at the heart of psychological manipulation is a collection of verbal and physical techniques designed to impose one person’s view or behavior on another when a conflict is encountered. Instead of respecting or accepting the other person’s position, a manipulator seeks to change and control it by resorting to emotional ploys. Physical threats are an example of manipulation at its crudest and most abusive level but there are many less obvious emotional ploys which can be used to get the other person to change his/her mind and agree with the manipulator’s position. Typically, manipulative tactics exploit the other person’s irrational fears and self-doubts. To get an idea of how more subtle manipulation feels, think of how Charles Boyer manipulated Ingrid Bergman in Gaslight. In the classic film, the evil husband (Boyer) drives his wife to the brink of madness by saying that things his wife saw actually happened – didn’t. The goal of the more subtle forms of manipulation is to discredit the validity of the person’s view by attacking their self-confidence or intelligence. 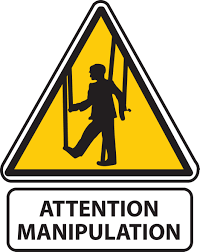 Denial and misrepresentation of the facts are also used in addition to name calling, blaming and refusing to respond to critical flaws in the manipulator’s arguments are but a few of the ways manipulators attempt impose their will on the others. People who are good at manipulation play upon emotional vulnerabilities and succeed in changing the subject from the issue at hand to the unreliability of the other person’s perception, knowledge or judgment. If you find yourself in a conversation where you encounter any of these tactics, realize that you are not having a reasonable conversation but are being manipulated. The key to dealing with someone who is being manipulative is to recognize it and refuse to play along. If a person you are talking cannot be rational and accept the facts or respect your opinion, it is critical that you understand that reason will not hold sway in the conversation and that coming to an agreement or a rational compromise is not possible. It is also important to remember that someone who is trying to manipulate does not care about the facts or your point of view. His/her only goal is to control the outcome to the situation. When manipulative conversations are detected, the only effective response to be made is to end the conversation immediately. Thus, a good rule of thumb doesn’t even try to talk with someone who is unable to be reasonable. While we can’t stop a person from being manipulative, we can decide not to engage or participate in a useless conversation. Doing so can greatly reduce the needless frustration and grief you will experience.